This tournament provides the opportunity to play doubles at a very low price! 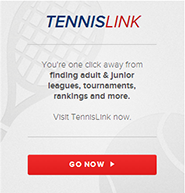 You may sign up with your doubles partner, or if you need a partner, you may email the tournament director to be paired with another player. and Doubles (2.5-4.5, Open) and Combo Mixed Doubles (5.0, 6.0, 7.0, 8.0, 9.0, Open). First Match Loser Consolation format…everyone is guaranteed at least 2 matches! Players are limited to two events.